(Phys.org)—DARPA's Cheetah robot—already the fastest legged robot in history—just broke its own land speed record of 18 miles per hour (mph). In the process, Cheetah also surpassed another very fast mover: Usain Bolt. According to the International Association of Athletics Federations, Bolt set the world speed record for a human in 2009 when he reached a peak speed of 27.78 mph for a 20-meter split during the 100-meter sprint. Cheetah was recently clocked at 28.3 mph for a 20-meter split. The Cheetah had a slight advantage over Bolt as it ran on a treadmill, the equivalent of a 28.3 mph tail wind, but most of the power Cheetah used was to swing and lift its legs fast enough, not to propel itself forward. To contribute to emergency response, humanitarian assistance and other defense missions, a robot needs to negotiate difficult terrain. Most rough-terrain robots use wheels or tracks to ride over bumps; however, the most difficult terrain demands the use of legs, as legs can step over both high obstacles and deep ditches. But coordinating the swing and lift of mechanical legs is more difficult than making wheels turn or tracks roll, and previous legged robots have been slow compared to wheeled or tracked ones. DARPA is working to create legged robots that don't sacrifice speed for mobility on rough terrain. Cheetah is being developed and tested under DARPA's Maximum Mobility and Manipulation (M3) program by Boston Dynamics. One of the program's main goals is to enhance robot movement and capabilities in natural and degraded manmade environments where defense personnel often operate. DARPA intends to test a prototype on natural terrain next year, but for now Cheetah runs on a treadmill in a lab to allow researchers to monitor its progress, refine algorithms and maintain its moving parts. 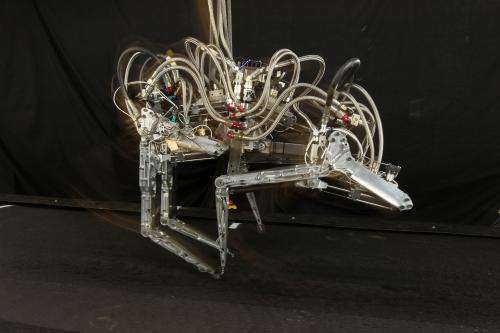 The current version of the Cheetah robot is powered by an off-board hydraulic pump and uses a boom-like device to keep it running in the center of the treadmill. The increase in speed since results were last reported in March 2012 is due to improved control algorithms and a more powerful pump. The robot has a ways to go before it can come close to matching the speeds of its living and breathing cheetah kin (the Cincinnati Zoo's cheetah, Sarah, was recently clocked at 61 mph), but that really isn't the point. "Modeling the robot after a cheetah is evocative and inspiring, but our goal is not to copy nature. What DARPA is doing with its robotics programs is attempting to understand and engineer into robots certain core capabilities that living organisms have refined over millennia of evolution: efficient locomotion, manipulation of objects and adaptability to environments," said Gill Pratt, DARPA program manager. "Cheetahs happen to be beautiful examples of how natural engineering has created speed and agility across rough terrain. Our Cheetah bot borrows ideas from nature's design to inform stride patterns, flexing and unflexing of parts like the back, placement of limbs and stability. What we gain through Cheetah and related research efforts are technological building blocks that create possibilities for a whole range of robots suited to future Department of Defense missions."